The Life System device is based on principles of quantum physics and have numerous tests and therapies that include bio-resonance and quantum biofeedback. This device uses a computer in which a special software analyzes the waves it receives from the patient's body. These systems are designed for stress management through biofeedback communication to the subconscious. This is holistic approach to the physical, mental, emotional and spiritual conditions. As a result of decreased stress levels, the body has the capacity to take charge in regulating body functions and self-balancing. It is very helpful for children and adults who suffer from ADD and ADHD. 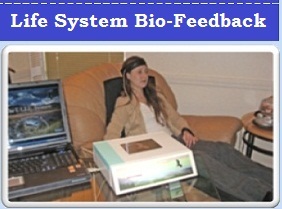 LIFE System Biofeedback is very effective in balancing physical and mental stress. It enables the Autonomic Nervous System to regulate properly. It also helps the Parasympathetic Nervous System to operate efficiently, to improve relaxation, sleep and regeneration. Biofeedback can be done with the LIFE System through specialized therapies that are built into the program. 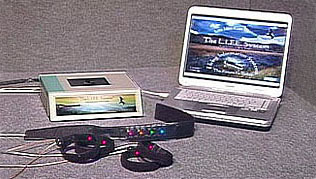 We have helped thousands of clients with the LIFE System utilizing the Neuro-feedback programs. Our clients have experienced dramatic results and have improved their feelings of well-being and quality of life. The developer of the Life System is a homeopathic physician who incorporated the theory of homeopathy to extend beyond the frequencies found in traditional homeopathy. There are several programs designed to balance stress patterns through sophisticated biofeedback. When the body reduces stress and receives positive information, the body then gains the strength and energy to restore itself to health and enhanced well-being. The program tests for resonance with homeopathics. You can easily load your own homeopathic remedies into the program, choose the potency and make a homeopathic remedy for your client. Stress responses to miasms are also included in the program to assist with hereditary discord. The Acu-Meridian program scans the client's energy field for responses to meridians and specific acupuncture points. A chart displays the exact point locations that are out of balance and focuses the energy into natural alignment. Each acupuncture point has a full description for the indications and symptoms. The Color program tests for responses to the ideal color for the client and then applies the vibration of the color for therapy. There numerous frequencies in the program for working with herbs, including Ayurvedic herbs. There is an extensive list of flower essences to choose from, including Bach Flower Remedies. You can easily add your own herbs, flower essences and formulas into the program and imprint your own energetic remedies. The nutrition program measures the energetic responses to nutrients and harmonizes the response for your clients to help them with assimilation. The program lists the top 3 vitamins, minerals and amino acids that your client is asking for and then delivers the nutrient energetically. Supplements of your choice can be added to the program and then tested and applied for your client's needs. This program detects organ stress and disharmony. Detoxification, inflammation and infection energy balancing can be applied to organs. Frequencies are applied to strengthen the energetic integrity of the organ. Studies show that 82% of all degenerative diseases start with underlying emotional stress. The LIFE System is effective for clearing trauma and emotional stress. Muscle relaxation, mind relaxation, emotional balancing programs, trauma stabilization, parasympathetic nervous system stimulation. The LIFE System takes the bias out of applied kinesiology. The program is designed to apply this step for you, taking the pain out of sore arms and client skepticism. The LIFE System detects the resonance for you. The client feels reassured when the nutrient, etc. shows up on the screen for them to see. Detoxification programs detect toxic energy disturbance and applies the frequency to allow the body to release the energy. Toxins such as pesticides, amalgam / mercury, bacteria, fungus, amoeba, viruses, vaccinations are energetically detected and released. Self-induced toxins can also be worked on energetically, such as caffeine, nicotine, alcohol and sugar. The program displays information to help your client to understand their stress responses and become more responsible for their body. For clients, the LIFE System creates an atmosphere that can help them to feel open about discussing their life on physical, emotional and spiritual levels. Beyond working with the physical body, The LIFE System offers a holistic mind-body approach. There are many programs that address the emotional, mental and spiritual well-being of your client. In the USA, the LIFE System is FDA registered. In Europe, the LIFE System is certified as a Class 2 medical device. The program has passed all safety testing and has been proven effective for stress reduction through independent laboratory testing.